Predicting the future of the news industry begins with understanding the history of newspapers and the current news delivery landscape. Because the Internet has brought fundamental shifts to news distribution, successful organizations of the future will capitalize on the digital world's economics and scale. This study documents the recent adjustments in American newspaper distribution and predicts the business models required for news organizations to survive. This research found that the Internet will foster the development of both scale dependent and ad-supported publications and niche organizations that cover a narrow subject. The successful media organizations and businesses of the future fall into one of the following three categories: 1) Scale Dependent and Ad Supported, 2) Subscription Dependent and Ad Supported, or 3) Internet-Only Niche Publications. This paper uses BuzzFeed, The Financial Times, The Wall Street Journal, Daring Fireball, and Stratechery as case studies to predict the future of the online news business. On the Internet, consumers can seamlessly navigate from platform to platform, story to story. Legacy news organizations have lost the benefit of bundling modular sections into an aggregated product. In the words of Michael Golden, vice chairman and president of The New York Times, "we have lost the power of the package." Information on the Internet is ubiquitous and news has become commoditized. Journalists can immediately reach consumers whenever readers have access to the Internet. Links to stories appear natively on popular social media platforms like Facebook and Twitter or shared within seconds through email or iMessage. Before the Internet, newspaper circulation was geographically limited by the reach of delivery trucks and the number of printing presses. Prior to 1994, the only three nationally distributed newspapers were The New York Times, USA Today, and The Wall Street Journal.8 Journalists can now reach consumers with time sensitive content directly through Twitter, Facebook, and comment platforms allowing for continuous dialogue and a 24/7 news cycle that is immediately and internationally viewed. The economics of the Internet have seen a massive shift as well. Journalism is unsustainable without a dependable business model. Online media fi rms are characterized by "low capital requirements, low fi xed costs, low production costs, low distribution costs, high marketing costs, no variable costs and rapidly declining costs." In contrast, "the financial/cost characteristics of print newspapers model consists of high capital requirements, high fi xed costs, high production costs, high fi rst-copy costs, moderate variable costs, low marketing costs, and rapidly declining average total costs. "10 For example, there is a hard cost to produce an extra copy of a print newspaper, whereas each "copy" of a news article is distributed at no cost on the Internet.11 Without profi tability, traditional newspapers cannot operate. Print and online newspapers have always depended on advertisements to supplement subscription revenue.12 Figure 1 shows how digital display advertising click-through rates have remain low on mobile devices. 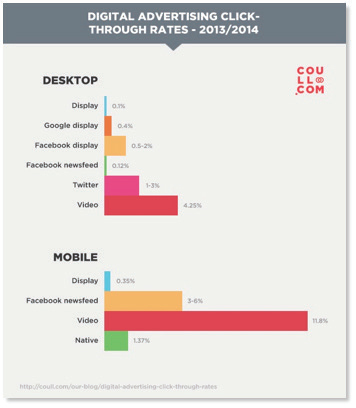 Consumers are more likely to click on Facebook advertisements or native advertisements. Advertisements that appear next to a story in a traditional newspaper format have been adapted for the Web through banner ads. Display or banner advertisements are typically disruptive to the viewer-consumers' reading experience and therefore ignored. Banner ads invade consumer privacy through scripts and cookies, which hurt the user experience.13 The most intrusive forms of online advertising, "roadblock" messages take over the entire screen before consumers can access the content they desire. Due to low click-through rates, publishers will need to find new ways to monetize their content by reforming their advertising methods. Consumers become indifferent to banner advertisements when the number of them increases due to a phenomenon called "Banner Blindness," where users consciously or subconsciously ignore advertisements while browsing the Internet. Both banner and roadblock advertisements harm the user experience more on mobile devices than personal computers because of the platform's smaller screen. Consumers are more tolerant of native advertisements that match the natural form and function of the platform.14 The best native advertisements contribute to the user experience and add value for consumers. Unlike banner advertisements, native advertisements provide entertainment and information without being obtrusive and annoying. While the Internet makes advertisements more relevant, consumers find programmatic advertising annoying and obtrusive. As smartphones and social network consumption via the Internet becomes ubiquitous, legacy business models are no longer viable. Digital media companies with business models ideally suited for the Internet are disrupting the newspaper and media businesses that depend on local circulation and constrained distribution systems. Online advertisements are faster, cheaper, measurable, interactive and more direct than analog ones. Newspaper businesses and traditional publishing conglomerates cannot survive in a world with increasing online advertising revenues because they are unable to capitalize on the potential for new and expanding advertising revenue streams. The monetization of digitally distributed information requires a refreshed mindset that recognizes the abundance of choice that consumers have, most of which allows for free to access content. In the digital world, there are an unlimited number of pages that can be published and an infinite number of advertisements to be sold. The marginal cost of publishing and ad sales is close to zero. Today's digital news startups are inventing new ways to monetize using the Internet where consumers can access most content for free. Increased Internet usage and sophistication prompted the rise of large organizations like Vox and BuzzFeed along with niche publications that cover a specific topic or personal or professional consumer interest profile such as Skift, Stratechery and Politico. Consumers are depending on platforms like Facebook, Twitter, email, and Apple News to receive written content instead of picking up a printed newspaper from their doorstep. Digital platforms can innovate quickly, accurately determine readership quantities, and shut down unsuccessful ventures with minimal capital expenditure. Johann Carolus published the first newspaper on a printing press in 1609. Since then, the newspaper has become a mass medium that has educated and informed literate citizens of the world.15 More than a century ago, the newspaper industry dealt with a major technological shift. In the 1890s, telephone service and improved human transportation revolutionized reporting while the Linotype machines increased the speed of printing. These technology shifts enabled the mass production of newspapers, growing the readership pool and number of newspapers that were printed and distributed. The number of English-language daily newspaper companies grew from 850 in 1880 to 2,200 in 1910. Daily circulation grew from 3.1 million to 22.1 million during the same period. Newspapers began charging customers a penny per issue in 1833, but did not start implementing advertisements until the 1880s when Adolph Ochs of The New York Times and William Randolph Hearst developed the advertising business model for newspapers. In the words of management guru Peter Drucker, "Advertising made it possible for them to distribute practically free of charge, without the profit coming from the market. "16 By 1914, 66 percent of newspaper revenue came from advertising, a figure that increased to 80 percent of revenue by the 1990s. To increase revenue, newspapers were incentivized to sell and distribute as many copies as possible. The size of newspapers grew along with the quantity of advertisements leading to increased costs, larger staff, and expansive, advanced printing presses. Substantial infrastructure served newspapers well when they held local monopolies. Before 1995 when the Internet first became readily accessible, newspapers depended on a monopoly/oligopoly structure due to geography and distribution constrains.17 Today, newspapers are an economically unsustainable business due to complex infrastructure, rising costs, and large staff base that once monopolized them. The rate of change in the newspaper industry has increased exponentially. It took The New York Times fifty years to reach 30,000 subscribers. In contrast, BuzzFeed launched in 2006, claims 200 million unique monthly visitors today.18 Free blogging platforms like WordPress and Medium give a voice to millions of Internet users while Facebook and Twitter allow millions more to share news and information on the Internet. The Internet allows for unprecedented scale that was impossible to achieve in the analog world. In 2005, newspapers reached a peak in annual revenue when American newspapers earned a collective $48 billion. By 2014 newspaper revenues fell to $19.9 billion, a 59 percent decrease. As the Internet grew in popularity, "digital media disrupted the aggregation model that was profi table for so long". Most consumers did not read the entire newspaper every day, but newspapers sold advertisements as if every page was read. As shown in Figure 2, newspaper revenue is declining across newspapers of all sizes.19 Newspaper weekday circulation has fallen 19% since 2004.20 In 2011, The New York Times attracted more than 30 million online visitors and a weekday circulation of 900,000 newspapers. While online visits dwarf analog ones, most of The New York Times' revenue comes from print; distribution is rapidly shifting from print to digital.21 Between 1995-2005, traditional media companies guarded revenue streams instead of innovating with new business models. 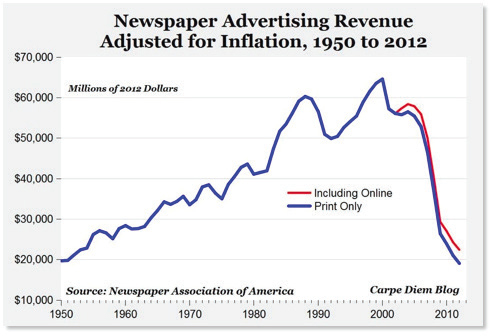 Since then, newspaper reach has increased but has not kept pace with online advertising revenues. As consumers switch to accessing content digitally, newspapers are burdened with the high, rising costs and carbon-waste impacts associated with purchasing ink, paper, and financing delivery drivers and trucks. Traditionally, the news business has separated journalists from the revenue side of the business. The American Society of Magazine Editors remains strict about "separating ad content visually from editorial content." Journalists enjoyed the luxury of thinking their business was different from other businesses aided by the constitutional protection of the free press. In contrast, digital media requires innovative ways of reaching audiences that benefi t from an abundance of information and with editorial and journalism closely tied to expanding revenue markets. According to Syracuse University professor Vin Crosbie, "Within the span of a single human generation, people's access to information has shifted from relative scarcity to surplus." While news has been commoditized, analysis and engagement have not. Writers with strong engagement allow media companies to charge higher ad rates as they build loyal readerships. The Internet gives writers an unprecedented opportunity to build interest-based relationships with readers from around the world. Writers can publish articles on niche topics of interest and monetize through highly targeted contextual advertising or subscriptions. These targeted websites attract readers who are highly interested in the content and are likely to follow the writers on social media or subscribe to email lists. Peretti launched BuzzFeed to track viral content. Kenneth Lerer, BuzzFeed's executive chairman, predicts that the content companies of the future will focus on mobile, video, social, and technology.25 Today BuzzFeed has more than 700 employees, fi ve billion monthly content views and more than 200 million monthly unique visitors.26 A self-defined "network-integrated media company, BuzzFeed derives insights from the data it receives to improve the content it produces. BuzzFeed aims to be indifferent to the platform where audiences view its content. Instead the company focuses on user experience, gathering data and building a sustainable business model.27 Today's massive social media trends were not self-evident when BuzzFeed fi rst began. Social media made it easy for content to spread quickly, while smartphones allowed readers to consume content at any time, anywhere. Increased data has developed BuzzFeed's content strategy with the goal of making viral content. Figure 3 demonstrates BuzzFeed's cross-platform approach to news distribution. Cross platform distribution is essential for adsupported publications that operate at scale because news is increasingly being consumed through social media channels and native applications. Instead of living on BuzzFeed's home page, most inbound traffic to BuzzFeed comes from Facebook and Twitter. Jason Kottke at Harvard University's Neiman Journalism Lab has observed that links on the Web have moved from "the loosely connected network of blogs to tightly integrated services like Facebook and Twitter." BuzzFeed does not strive to be a destination site focusing on driving traffic from networked social media sites.33 BuzzFeed's dependence on social media platforms has its dangers. Facebook's control over BuzzFeed's content will increasingly threaten its monetization potential. From January-September 2015, BuzzFeed's visits through Facebook fell 40.8 percent to 23.7 million.34 Facebook, BuzzFeed's biggest referrer, controls what news feed is delivered to its 1.5 billion users.35 The newsfeed filters use an algorithm to filter what Facebook users see. Traditional ad agencies see BuzzFeed as a threat. The BuzzFeed model challenges the traditional separation between editorial content and the business of journalism. BuzzFeed continues to raise venture capital and grow the company while Time Inc., Newsweek and The New York Times have laid off employees.36 Meanwhile, BuzzFeed's native advertisements like the Jet-Blue-sponsored "The 50 Most Beautiful Shots Taken Out of Airplane Windows" or the BBC America-sponsored "10 Beautiful Places in the World that Actually Exist" monetize without being intrusive to readers.37 The BuzzFeed model works best at scale. This model is not a viable option for startups without venture capital, according to Rob Norman on GroupM, the world's largest media investment group. Not every successful online company depends on scale like BuzzFeed. Internet economics virtually guarantees that a few publishers will dominate page views through viral content, while others will have to specialize. Sustaining business models are essential for a long-living publication because of the high costs of journalism. Sustainable business models generate ongoing revenue for the organization while providing value to the customer.41 Organizations that charge for advertising believe that pay walls make viral posts impossible and diminish the potential influence of their organization. Publishers who keep their content behind a pay wall do so because they believe consumers should pay directly for the steep costs of journalism. Even in the traditional business model, newspapers underpriced subscription costs in hopes of increased ad revenue. The Story So Far cites three reasons that companies should charge for online access to content. Subscriptions increase revenue, and alter the notion that print media subscriptions cost money. Online content, however, remains free. However, paying audiences are generally more valuable to advertisers because payment demonstrates a deep commitment to the publication. When pay walls were first introduced, publishers feared that pay walls would detract from precious ad revenue.43 Ad revenue benefits from scale and reach. Both are impossible to achieve when content is hidden from the general population behind a pay wall. The Financial Times and The Wall Street Journal have seen the most success transitioning from a newspaper to an online subscription service. Both companies monetize through advertisements and subscriptions to serve a specialized customer segment. These publications are considered must-reads for people who work in finance, business strategy, and banking. The publications leverage subscriber data and demographics to deliver targeted banner advertisements, track trends, and increase ad prices.44 The Financial Times and The Wall Street Journal know consumers will pay for content because of its influence within the business community. The wealthy demographic of readers is leveraged to charge high prices to advertisers who want to reach an affluent audience. The Wall Street Journal was the first newspaper with a profitable and sustainable e-business model.47 At the beginning of the 1900s, The Wall Street Journal, with a circulation of 11,000, grew to more than 1 million by the middle of the 20th century and more than 2 million in 2010. Today, The Wall Street Journal is regarded as "the most respected source of business and financial news in the United States" and is perceived as a premium brand.48 The online paper sits behind a partial pay wall. Some content is free to the general public and some is saved for paying subscribers. Most of The Wall Street Journal's revenue comes from physical newspapers despite a growing online presence. Most of its revenue depends on a subscription model supplemented by premium content. Both The Financial Times and The Wall Street Journal target an affluent, Internet-savvy, niche demographic. The newspapers have earned strong, reputable brands and are considered must-reads for many business professionals. By consistently serving a pre-defined customer segment and pursuing a narrowly focused strategy, they will continue to serve as a model for organizations that struggle to fight off disruption. The Financial Times and The Wall Street Journal are not the only successful targeted publications on the Web. The enormous quantity of Internet users has paved the way for writers to monetize their blogs by diving deeply into a specific subject. Mark Briggs acknowledges that blogs are not necessarily a business model, but rather the style of Web publishing with the lowest barrier to entry. Bloggers benefit from low operating costs and "maniacal devotion" to a niche topic targeting a specific, returning and interested audience.49 Independent bloggers can dependably rely on an ad-supported business model or a subscription model. John Gruber and Ben Thompson from Daring Fireball and Stratechery, respectively, prove that people will religiously follow individuals who consistently write high-quality, differentiated content. Internet startups like Tumblr, Twitter, Pinterest, Reddit, Facebook, SnapChat, and Instagram have unbundled the traditional blog. Following people on the Internet is more common now than it has ever been.50 Writers like Gruber and Thompson benefit from a low elasticity of substitution.51 Differentiated content focusing on a specific subject attracts loyal readers who will pay for content and advertisers who know their advertisements will reach their desired demographic. Lisa Williams, founder of PlaceBlogger, a startup that aggregates "hyperlocal" news sites, notes, "The Web favors things that are narrowly comprehensive" that say "everything about something." Writers who choose to monetize through a pay wall must establish a trusted and respected brand that people will pay for. To grow their audience, independent writers like Thompson at Stratechery have established an audience through free social media marketing channels. Thompson's fifty-one thousand tweets have led to thirty-two thousand followers. Thompson graduated from the University of WisconsinMadison with a degree in political science before receiving graduate degrees in engineering management from Northwestern University and a Master of Business Administration from Northwestern's Kellogg School of Management. His additional experience at Apple and Microsoft give him the credibility needed to charge readers for daily content. For $10 per month or $100 per year, subscribers receive exclusive access to Thompson's Daily Update. The Daily Update "consists of substantial analysis of the news of the day delivered via four daily emails, in addition to the free weekly article." Subscribers also receive unrestricted access to Stratechery's Membership Forum, which provides readers with an avenue for in-depth discussions about tech strategy and the implications of technology on society moderated by Thompson along with priority email access.55 For additional ancillary revenue, Thompson monetizes his "Exponent" podcast where readers listen to the thought-process and further justification for his analysis. Thompson's differentiated content serves a niche audience that is willing to pay for high-quality, exclusive content. According to Thomson, "Blogging scales well because it costs the same amount to produce a post on the Internet that reaches 100 people as one that reaches 100,000. I am, of course, acutely aware that there is a tradeoff when it comes to the subscription business model: by making something scarce, and worth paying for, you are by definition limiting your number of readers." Thompson's readers pay for access to him. In a world of abundant and commoditized information, people remain distinct and irreplaceable. Thompson utilizes the Internet's low cost structure to charge for differentiated content that his affluent consumers will pay for. To promote himself, Thompson combines a trusted following on Twitter and uses it to promote his free weekly article and ad-supported "Exponent" podcast. Instead of focusing on scale and a low revenue per consumer, Thompson serves a niche of followers who care about his targeted content enough to pay a recurring subscription fee. Targeted verticals will continue rising with the growth of the Internet. Daring Fireball has paved the way for ad-supported companies like Skift, CoinDesk, Fast Casual, and The Business of Fashion. To supplement ad revenue, these companies are monetizing with events or selling exclusive content to businesses and affluent readers. Meanwhile, Stratechery has influenced subscription-dependent organizations like Mattermark, CBInsights, and The Information. Niche websites must deliver important and relevant information that is exclusive to subscribers and cannot be found elsewhere. To boost their value proposition, subscription-dependent organizations host private meet-ups and events to grow their community of committed readers. These companies benefit from the economics of the Internet and its ability to bring people with shared interests together. The publications of the future will be the ones that capitalize on the Internet's economics and scale. The winners will serve the broadest reach or target narrow topics with unprecedented depth. Most of the future successful companies will focus on a small-segment, niche strategy instead of a mass-market broadbased one.56 The business models of mid-sized newspapers with local monopolies are increasingly inefficient and will continue to be eliminated.57 The expanding scale of the Internet means free content can effectively spread to every user on the Internet, while experts on a topic can reach interested consumers who are willing to pay a higher cost for differentiated, or customized content. Small, ad-supported publishers will increasingly depend on targeted advertisements and sponsored posts. Companies will always pay for ads that reach their targeted audience on a website that these audiences routinely visit. The most successful ones will use aggregation to provide value with differentiated content.59 The news organizations of the future will be smaller, often published by a single writer who has a narrow focus and is a specialist in the media content field they cover. Monetization will come from dedicated readers who will pay for access to premium content, access to chat forums and further discussion. Monetization will also come from the interest base of a loyal community of subscribers.60 These news organizations will be more nimble, benefit from low costs, and develop modern ad sales strategies. Media distributors will gain influence over a world of increasingly abundant information. Algorithmic feeds of Facebook, Twitter, and Google search will control the content that consumers see. Most consumers will see content that is widely read and shared like lifestyle, fashion, celebrity, and sports news. Much of the best content will serve an affluent readership with the means to pay for exclusive access to focused writers who are experts on a particular vertical market and content experience. Expect new business models to develop with the growth of the Web. The Internet is growing rapidly, changing daily, and companies around the world are working to bring the Internet to everybody in the world. The future promises expanded digital infrastructure promoting digital literacy, free expression, and ubiquitous Internet access.61 Citizens of many third-world countries will use their smartphones to access the Internet for the first time in their lives. In less than a decade, free online content will be available to almost everybody in the world. Businesses that thrive on the Internet by developing sustainable revenue streams will lead, develop, and create a more networked, educated, and open world. This author extends thanks to Don Grady, associate professor and associate dean at Elon University, for guidance and support throughout the research project. Johnson, R, and A Gutierrez. "Reinventing the Business Model of the Newspaper Industry: Electronic Business Models and the Newspaper Industry The Wall Street Journal as Case Study." Blekinge Institute of Technology, 2010. http://www.diva-portal.org/smash/get/diva2:832292/FULLTEXT01.pdf. Page 24. Johnson, R, and A Gutierrez. "Reinventing the Business Model of the Newspaper Industry: Electronic Business Models and the Newspaper Industry The Wall Street Journal as Case Study." Blekinge Institute of Technology, 2010. http://www.diva-portal.org/smash/get/diva2:832292/FULLTEXT01.pdf. Briggs, Mark. Entrepreneurial Journalism: How to Build What's Next for News. Thousand Oaks, California: CQ Press, 2012. Thompson, Ben. "FiveThirtyEight and the End of Average." Stratechery by Ben Thompson, March 17, 2014. https://stratechery.com/2014/fivethirtyeight-end-average/. Thompson, Ben. "Newspapers Are Dead; Long Live Journalism." 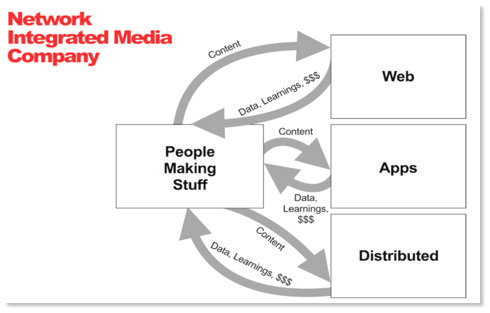 Stratechery by Ben Thompson, March 24, 2014. https://stratechery.com/2014/newspapers-are-dead-long-live-journalism/. Johnson, Mark W., Clayton M. Christensen, and Henning Kagermann. "Reinventing Your Business Model." Harvard Business Review. Accessed November 15, 2015. https://hbr.org/2008/12/reinventing-your-business-model. Johnson, R, and A Gutierrez. "Reinventing the Business Model of the Newspaper Industry: Electronic Business Models and the Newspaper Industry The Wall Street Journal as Case Study." Blekinge Institute of Technology, 2010. http://www.diva-portal.org/smash/get/diva2:832292/FULLTEXT01.pdf. Page 62. Johnson, R, and A Gutierrez. "Reinventing the Business Model of the Newspaper Industry: Electronic Business Models and the Newspaper Industry The Wall Street Journal as Case Study." Blekinge Institute of Technology, 2010. http://www.diva-portal.org/smash/get/diva2:832292/FULLTEXT01.pdf. Page 56. Thompson, Ben. "Differentiation and Value Capture in the Internet Age." Stratechery by Ben Thompson. Accessed November 11, 2015. https://stratechery.com/2014/differentiation-value-creation-internet-age/. Salmon, Felix. "Ad Tech Is Killing the Online Experience." The Guardian, July 19, 2015, sec. Media. http://www.theguardian.com/media/2015/jul/19/ad-tech-online-experience-facebook-apple-news. Marcus, Aaron. Design, User Experience, and Usability: Web, Mobile, and Product Design: Second International Conference, DUXU 2013, Held as Part of HCI International 2013, Las Vegas, NV, USA, July 21-26, 2013, Proceedings. Springer, 2013. Escher, Thomas. "The Newspaper Is Dead. Long Live the Newspaper. : Like My Style? Read On!" Medium, October 15, 2014. https://medium.com/thoughts-on-journalism/the-newspaper-is-dead-long-live-the-newspaper-8b7969b4d4b6. Johnson, R, and A Gutierrez. "Reinventing the Business Model of the Newspaper Industry: Electronic Business Models and the Newspaper Industry The Wall Street Journal as Case Study." Blekinge Institute of Technology, 2010. http://www.diva-portal.org/smash/get/diva2:832292/FULLTEXT01.pdf. Page 30. Andreesen, Marc. "The Future of the News Business: A Monumental Twitter Stream All in One Place | Andreessen Horowitz." Accessed November 13, 2015. http://a16z.com/2014/02/25/future-of-news-business/. Barthel, Michael. "Newspapers: Fact Sheet." Pew Research Center's Journalism Project. Accessed November 8, 2015. http://www.journalism.org/2015/04/29/newspapers-fact-sheet/. Peretti, Jonah. BuzzFeed's Take on the Future of Media, July 15, 2014. https://www.youtube.com/watch?v=t_w-lscnhEk. Johnson, R, and A Gutierrez. "Reinventing the Business Model of the Newspaper Industry: Electronic Business Models and the Newspaper Industry The Wall Street Journal as Case Study." Blekinge Institute of Technology, 2010. http://www.diva-portal.org/smash/get/diva2:832292/FULLTEXT01.pdf. Page 11. Rice, Andrew. "Does BuzzFeed Know the Secret? : Jonah Peretti's Viral-Content Machine Purports to Have Solved the Problems of Both Journalism and Advertising at Once, All with the Help of a Simple Algorithm." New York, April 15, 2013. Staff, BuzzFeedPress BuzzFeed. "BuzzFeed Announces Major Expansion Across All Business Lines." BuzzFeed. Accessed November 8, 2015. http://www.buzzfeed.com/buzzfeedpress/buzzfeed-announces-major-expansion-across-all-business-lines. "The BuzzFeed Team." BuzzFeed. Accessed November 10, 2015. http://www.buzzfeed.com/about/team. Nguyen, Dao, and Ashley McCollum. "Making Content For The Way People Consume Media Today." BuzzFeed, October 23, 2015. http://www.buzzfeed.com/daozers/making-content-for-the-way-people-consume-media-today. Salmon, Felix. "BuzzFeed." Medium, August 11, 2014. https://medium.com/@felixsalmon/normally-when-some-big-deal-is-announcedinthe-business-world-a-rah-rah-press-release-goes-out-236f5ae86ee4#.1da7w5bom. Heaton, Alex. "Content Marketing Case Study: Buzzfeed Smart Insights Digital Marketing Advice." Smart Insights, July 1, 2014. http://www.smartinsights.com/content-management/content-marketing-strategy/buzzfeed-case-study/. Manjoo, Farhad. "Fall of the Banner Ad: The Monster That Swallowed the Web." The New York Times, November 5, 2014. http://www.nytimes.com/2014/11/06/technology/personaltech/banner-ads-the-monsters-that-swallowed-the-web.html. Issac, Mike. "50 Million New Reasons BuzzFeed Wants to Take Its Content Far Beyond Lists The New York Times." New York Times, August 10, 2014. http://www.nytimes.com/2014/08/11/technology/a-move-to-go-beyond-lists-for-content-at-buzzfeed.html?_r=1. Rey, Jason Del. "Inside the BuzzFeed Pricing Model: How One ‘Native Advertising' Pioneer Tries to Make It All Add up." Advertising Age 83, no. 39 (October 29, 2012). Kottke, Jason. "The Blog Is Dead, Long Live the Blog." Nieman Lab, December 19, 2013. http://www.niemanlab.org/2013/12/the-blogisdead/. Ingram, Mathew. "Facebook's Referral Traffic Has Plunged for Some Media Outlets Fortune." Fortune, November 9, 2015. http://fortune.com/2015/11/09/facebook-media/. Br, JetBlue Getaways, and Publisher. "The 50 Most Beautiful Shots Taken Out Of Airplane Windows." BuzzFeed, June 3, 2012. http://www.buzzfeed.com/h2/aaad/jetbluegetaways/the-50-most-beautiful-shots-taken-out-of-airplane. Thompson, Ben. "Why BuzzFeed Is the Most Important News Organization in the World." Stratechery by Ben Thompson. Accessed November 8, 2015. https://stratechery.com/2015/buzzfeed-important-news-organization-world/. Constine, Josh. "BuzzFeed's Future Depends On Convincing Us Ads Aren't Ads." TechCrunch. Accessed November 8, 2015. http://social.techcrunch.com/2014/08/12/buzzhome/. Johnson, R, and A Gutierrez. "Reinventing the Business Model of the Newspaper Industry: Electronic Business Models and the Newspaper Industry The Wall Street Journal as Case Study." Blekinge Institute of Technology, 2010. http://www.diva-portal.org/smash/get/diva2:832292/FULLTEXT01.pdf. Page 67. Grueskin, Bill, Ava Seave, and Lucas Graves. The Story So Far: What We Know About the Business of Digital Journalism. New York: Columbia University Press, 2011. http://cjrarchive.org/img/posts/report/The_Story_So_Far.pdf. Page 67. Johnson, R, and A Gutierrez. "Reinventing the Business Model of the Newspaper Industry: Electronic Business Models and the Newspaper Industry The Wall Street Journal as Case Study." Blekinge Institute of Technology, 2010. http://www.diva-portal.org/smash/get/diva2:832292/FULLTEXT01.pdf. Page 60. "Financial Times." Financial Times. Accessed November 12, 2015. http://aboutus.ft.com/corporate-information/ft-company/. Grueskin, Bill, Ava Seave, and Lucas Graves. The Story So Far: What We Know About the Business of Digital Journalism. New York: Columbia University Press, 2011. http://cjrarchive.org/img/posts/report/The_Story_So_Far.pdf. Johnson, R, and A Gutierrez. "Reinventing the Business Model of the Newspaper Industry: Electronic Business Models and the Newspaper Industry The Wall Street Journal as Case Study." Blekinge Institute of Technology, 2010. http://www.diva-portal.org/smash/get/diva2:832292/FULLTEXT01.pdf. Page 70. Johnson, R, and A Gutierrez. "Reinventing the Business Model of the Newspaper Industry: Electronic Business Models and the Newspaper Industry The Wall Street Journal as Case Study." Blekinge Institute of Technology, 2010. http://www.diva-portal.org/smash/get/diva2:832292/FULLTEXT01.pdf. Page 53, 60. Klein, Ezra. "What Andrew Sullivan's Exit Says about the Future of Blogging." Vox, January 30, 2015. http://www.vox.com/2015/1/30/7948091/andrew-sullivan-leaving-blogging. Thompson, Ben. "Blogging's Bright Future." Stratechery by Ben Thompson, February 2, 2015. https://stratechery.com/2015/bloggingsbrightfuture/. "Daringfireball.net Traffic Statistics." SimilarWeb. Accessed November 12, 2015. http://www.similarweb.com/website/daringfireball.net. Gruber, John. "Daring Fireball: RSS Feed Sponsorship." Daring Fireball. Accessed November 12, 2015. http://daringfireball.net/feeds/sponsors/. Thompson, Ben. "The Daily Update." Stratechery by Ben Thompson. Accessed November 13, 2015. https://stratechery.com/membership/. Johnson, R, and A Gutierrez. "Reinventing the Business Model of the Newspaper Industry: Electronic Business Models and the Newspaper Industry The Wall Street Journal as Case Study." Blekinge Institute of Technology, 2010. http://www.diva-portal.org/smash/get/diva2:832292/FULLTEXT01.pdf. Page 32-33. Grueskin, Bill, Ava Seave, and Lucas Graves. The Story So Far: What We Know About the Business of Digital Journalism. New York: Columbia University Press, 2011. http://cjrarchive.org/img/posts/report/The_Story_So_Far.pdf. Page 133. Grueskin, Bill, Ava Seave, and Lucas Graves. The Story So Far: What We Know About the Business of Digital Journalism. New York: Columbia University Press, 2011. http://cjrarchive.org/img/posts/report/The_Story_So_Far.pdf. Page 131. West, Darrell. "Digital Divide: Improving Internet Access in the Developing World through Affordable Services and Diverse Content." The Brookings Institution, February 2015. http://www.brookings.edu/blogs/brookings-now/posts/2014/02/how-the-internet-and-data-helpthedeveloping-world. Page 22.